ANALYSIS AND OPINION: One of the worse things a driver can do in a late model car engaged in an accident is to fib or outright lie. You see, whether you realize it, their car may help you, but your car is going to make it really easy to tell your side of the story, with data and soon even images, sooner than later, and regardless of what kind of shape the car is in, and whether for your benefit or not. Your car always telling the truth, is one thing! Getting on the same page with you, is another. When engaged in a vehicular collision or stopped by the side of the road by police, with the activation of Tesla’s AutoPilot, drivers are finding themselves in trouble and it’s more about their mouths than memory. Crisis allows us to either drop our guard or proceed with over-caution, so we tend to forget or over obsess about detail, like tiny cameras recording our actions. Even if the car is missing one part, one software update, that when added makes it “autonomous acting,” IT IS STILL NOT AUTONOMOUS, even if YOU add the missing piece. It must be certified, otherwise you are breaking the law. Unless by an act of Congress, or at the state level, a state legislature enactment giving someone or another body the authority for determination, an official autonomous vehicle certification is what the Society of Automotive Engineers say it is, NOT based on what you determine by their scale. The Society of Automotive Engineers is a professional organization, it is NOT a governing authority. Even the SAE is controversial. Some want another organization or another scale. For now and for standardization, SAE is used as a baseline so we’re all on the same page, but this may change. 5 is naked no traditional pedal steering controls. 4 is drives like a regular car but can function like 5. 3 is Audi A8 but that’s on sale but experimental. 2 to 3 is AutoPilot. I drive a BMW 328i. That’s zero 0. At the scene of an accident, be careful what you say and do. When in doubt you either don’t remember, recall, not sure, or better yet, don’t say anything at all. Unless the circumstances are really freaky and serious, like a Toyota stuck pedal, a Ford gas tank, a GM ignition switch, a Ford Explorer with a Firestone tire that really really got in the way, never never tell someone who’s about responsibility and accountability “my car did it.” They will go out of their way, in fact it is beyond a blessing to prove you wrong even if it wasn’t about you. Let them find out. Don’t tell them that. If you don’t know what to say, say nothing. That’s your right. If you can’t remember say so! FINALLY: You bought the car. You wanted one? Well, it’s yours, OWN IT. Stop pushing buttons to avoid responsibility. And if this about an ignition switch you better damn be right! No flaking!! With all these navigation cameras car makers have been adding to their adaptive cruise control suites, it would make sense that these cameras would be used for other purposes. And like everything else in life, perhaps even for those times you prefer no surveillance at all. So if the camera is being used for surveillance when you want it to, I’m sure eventually it will be used if not already for surveillance when it is necessary and critical, like when you engage in a vehicular accident or some kind of emergency. This gets to my point about how automobiles are coming to the same level of sophistication and standard of care in operation no differently than aircraft. Some of these vehicles in fact like Tesla’s, record and/or carry data at the same level of sophistication of a wide body black box. One of things that irritates me about “things Tesla“ is hearing the foolish people in the news feeds actually having the silly gall to tell a state trooper or an NTSB crash team investigator something along the line of “My Tesla did it, not me!” Oh how sweet of them to blame their car! But it’s not who was driving anymore as it is much more now to consider who was responsible? When you are at the scene of an accident whether your fault or not, remember that the dynamics of these incidents are dramatically changing with recent technology, and like any kind of surveillance and data recording it can become your best friend or your worse enemy. Responsibility. You know, remember that word our parents taught us? Abrogating or prevaricating responsibility is something that as we head off well into the 21st century, just seems more easier to do! Eventually all the things we do in the day that are essential will be passed off to some kind of automation. What that leaves however, is lack of accountability, responsibility, and really law and order. Leadership falls apart when no one’s in charge and it is there where tyranny begins. It is a slippery slope and a dangerous game. Credibility is the most important thing you can have in any situation, there’s nothing like an incident happening and your word is taken like gold that that’s the way it occurred. In an age where government officials now blatantly tell lies beyond stretching the truth, when in the past it seems they didn’t want to lie but somehow found a way to try not to, they now go out of their way to absolutely do so. And when it comes down to even having cameras installed in your car, by the company that makes it, something unfathomable years ago, there are truly all eyes watching us now. 1984 was 35 years too late! So we want you to be honest, with yourself, and with us. It really doesn’t pay to lie, and if you don’t know or honestly can’t remember, then say so as an answer! But you hurt your integrity, credibility, and honesty when you tell such a lie in earnest that obviously that wasn’t the case, people won’t believe you to get so turned off by you, you won’t take you seriously, for you to lose your cause. 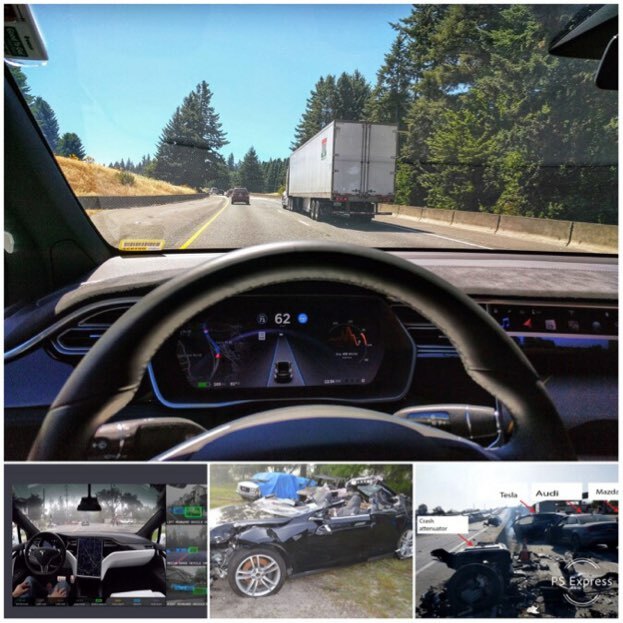 Here’s another “My Tesla did it, not me,” Autopilot crash: this time a Model S collides into a standing object at a whopping 80MPH while the prevaricator admits he was using his cell phone. He then files suit against Tesla claiming he was duped by the car maker. Yeah, Tesla duped us with this one. We assumed Tesla would assess the driver to be sure he was competent and mature enough to purchase and drive such a car like this. We’re disappointed and sadly mistaken as a result. Not Autonomous, But Treat Them That Way-Correctly! In this new era of electric and autonomy, we own the technologies and are responsible for the things and concepts that come with and around them, not the other way around. We take responsibility not just for our vessels themselves whether we’re actually piloting them or not, but also for the conduct of both our cars and ourselves. We are too soon to call these things “driverless,” but the time to start treating them that way is right now, so that we get into good habits about them. As smart as our cars may be becoming, we have also become the captains of our vessels, not the other way around as well. In some ways it does make things easier, but operating an adaptive cruise control system like AutoPilot in a vehicle is a big responsibility; we should look at the experience akin to an airline captain switching his airliner to “Auto Pilot,” and NOT Ron Pepiel’s “set it and forget it” chicken roaster mentality. And with that, take command of your vehicle in AutoPilot anyway, because your car can still kill us all, and whether you’re actually in full control or not, like a plane or ship’s captain, you are still responsible for your vehicle. And if you’re paying attention ahead like you’re supposed to, to see the car might be getting over it’s head, the solution is simple like Captain Sulley would do, turn AutoPilot off and take command! If you now get into an accident with your electric adaptive cruise equipped and/or autonomous car, and you tell the police it was engaged in some kind of higher level adaptive cruise control like “AutoPilot” or it’s equivalent, the police are going to call the National Transportation Safety Board (NTSB) to have a crash team respond immediately. This was unheard of back in the day for a passenger car, and I wish you all knew the significance of this. I need my professional truck and bus drivers to speak up and tell me their NTSB stories! They were portrayed as harsh in the Sully movie but that should give you an idea of what happens if you truly mess up! Mind you, “crash team” is not just about a NTSB car crash team. “Crash Team” is the same team that responds to airline crashes we see on the news. These are the same people who have talent to investigate exacting details down to a science, when a wide-body jet crashes, to hold captains and pilots of the most sophisticated aircraft in the world accountable for their actions. Do you see where I’m going with this? Driving was once a simple act of eyes open, hands on the wheel, and don’t drive over you’re head. So not anymore. It really is turning into an experience closer to piloting a business jet almost to the same level of accountability and responsibility and intensity. And now here’s AutoPilot Prevaricator with his Tesla telling them, “I didn’t do it.” We’ve been down this road already. How do you think that’s going to fly (definitely no pun)? I don’t care if a pilot is a paid professional and you’re not. You really now are one, and you’ll be treated that way. A push of a button doesn’t always excuse us from life’s responsibilities. With the responsibilities and dangers that now come with these cars, you’re now are a captain of your vessel, whether you like it or not. You wanted an electric robot-like car. You wanted a Tesla. Well, here you are. God forbid you are ever in an accident, take a breath, stop for a moment, and think. I’ve gotten blowback for this in the past with these AutoPilot accidents, that some don’t get it, that I’m trying to help ALL OF YOU, especially those who put themselves into this quandary with the police at roadside, to intensify the situation when the NTSB comes on the scene. These people don’t play games. If they wreck a 747 pilot at fault in a report to jeopardize his FAA license, they’ll easily do it to you too with your flimsy state driver’s license! As a police officer and a truck and bus driver I know: the NTSB is a professional driver’s worse nightmare! It’s your turn to make the NTSB yours! Welcome to the new dynamic of AI and electric technology. So trust me please, the situation is about to become more serious if someone other than yourself is hurt and a car involved was in AutoPilot. Make sure your facts are straight. DON’T LIE. Your Tesla is going to make it really easy to tell your side of the story, with data and images, sooner than later, and regardless of what kind of shape the car is in, and whether for your benefit or not. If you drive anything else late model, it may not be as sophisticated to download the data or get imagines, but trust me, the NTSB are truly the Princes of Darkness, and their job is to shed some light! These are the same people who the President of the United States sent with the FBI behind enemy lines to investigate that Malaysian jet that crashed in Ukraine to find evidence against Russia. The plane sat there vandalized with bodies and body parts still in and around it for days, and then weeks after that when the crash team arrived!! Blaming a car, unless the circumstance is that bizarre like a stuck pedal, or an exploding gas tank, or a stuck ignition key, is not going to work. Switch-on automation is not a switch-off for responsibility. In the end, we own the technology, not the other way around. For those using that silly child-like excuse who don’t deserve to be in a league of being a Tesla owner, who should be instead confined to a corner in punishment, I say stop acting like a child and GROW UP. Photos originally all come from Tesla’s website and taken from Wikipedia as now public domain. According to Wikipedia the exception is the photo of the demolished black Model S and blue Model X. Those come from the NTSB. They too are now public domain. Regardless, they are all published here and all under Section 107 of the Copyright Act 1976, allowance is made for "fair use" for purposes such as criticism, comment, and news reporting. What do you think of Al’s crazy ideas of “the Tesla did it not me?” Al truly is full of himself ain’t he? Please let us know below so we can finally fire him!